At the 11th hour on the 11th day of the 11th month of 1918, the Great War ended. 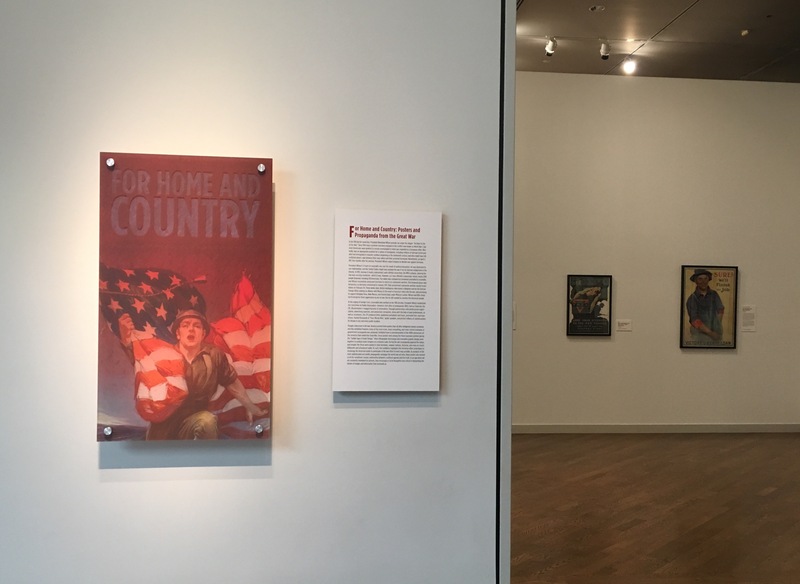 One hundred years later, BYU Museum of Art commemorates the Armistice centennial anniversary with an exhibit titled “For Home and Country: Posters and Propaganda from the Great War.” The exhibit runs September 22, 2018 through January 12, 2019. “For Home and Country” offers an in-depth look at the BYU Museum of Art’s outstanding collection of World War I posters. These bold, dramatic posters played a central role in the sophisticated propaganda efforts of World War I, and the exhibit aims to place them in historical and cultural context. Among the outstanding examples are: Howard Chandler Christy’s Fight or Buy Bonds, Third Liberty Loan (1917); The Greatest Mother in the World by Alonzo Earl Foringer (1917); W.B. King’s Hold Up Your End! War Fund Week (1917); “Good-bye Dad, I’m Off the Fight for Old Glory, You Buy U.S. Gov’t Bonds” by Lawrence Harris (1917); and For Home and Country—Victory Liberty Loan (1918) by Alfred Everett Orr. Highlighted at the exhibit was the Women at War section, showcasing women’s participation in civic, social and military causes in the early Twentieth Century. Although women did not yet have the right to vote and were expected to stay in traditional roles, the posters show that the nation relied upon their contributions. In particular, the Christy Girl, developed by Howard Chandler Christy, embodied the ideal American female, and appears in some of the most iconic propaganda posters of the time. Curator Kenneth Hartvigsen noted that the 100th anniversary of Armistice Day would be the perfect time to share BYU Museum of Art’s outstanding collection. “Seeing them all in one space is quite powerful, and I think our visitors will learn a lot about the history of the war, but will also be impressed by the sheer beauty of these posters,” he said. The exhibition also features propaganda posters from Germany, France and England. Of particular note is Remember Belgium—Buy Bonds by Ellsworth Young, a U.S. propaganda poster depicting an ominous, Hun-like silhouette of a German soldier abducting a girl, conveying the fearful message that America should not ignore the atrocities of war. We ventured to see the exhibit on a Saturday afternoon. As a history buff, my husband was the perfect tour guide. As marketer, I was fascinated by the strategies echoed in modern campaigns. My daughter, a history-loving journalism student, was especially interested in recognizing the obvious and deliberate bias that we often discuss as evident in current day news and social media. “For Home and Country” is an excellent exhibit for a variety of ages and interests. Admission is free; donations are welcome.